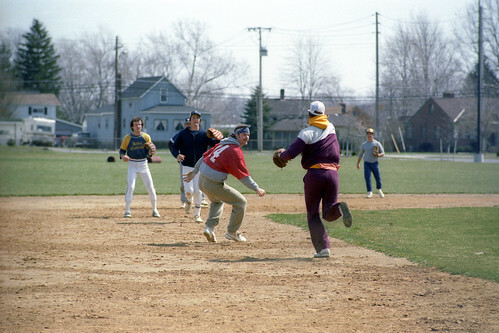 Third baseman Pat Fogarty runs Scott Medvin back to second base during practice at the B-W baseball field in March 1983. I’ve added a dozen new photos to the B-W Baseball 1983 photo set at Flickr. They were taken after the team finally started practicing outside of Ursprung Gymnasium, and you can really see how much Heritage Field has changed over the last three decades, especially when you spot the old, wood benches that served as our “dugout” and the rolls of snow fence waiting to be put up in the outfield. Junior pitcher Josh Scott threw the fourth no-hitter in B-W baseball history last Saturday when the Yellow Jackets beat Ohio Christian University 12–0 in Chillicothe. He struck out six OCU batters without a walk and came within a couple outs of throwing a perfect game. The only Trailblazers to reach base got there on a dropped third strike and an error. Josh’s nearly perfect performance earned him OAC Pitcher of the Week and NCBWA Division III Pitcher of the Week honors. 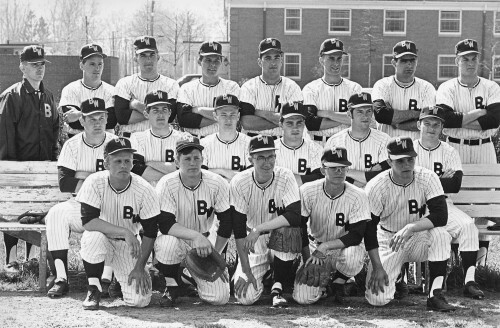 B-W’s previous no-hitters were thrown by Bob Love against Otterbein College in 1965, Jeff Burton against Heidelberg College in 1980 and Aaron Krieger against Ohio Northern University in 2005. This television news story by WJW Channel 8 sports reporter Dan Coughlin aired on March 20, 1987, the same day the Yellow Jackets left for their spring break trip to Alabama. 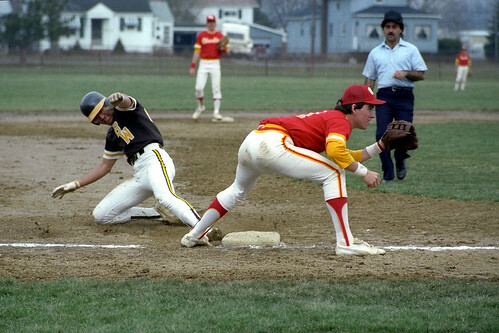 The Jackets opened their season with “unprecedented enthusiasm,” Coughlin reported, because of players like third baseman Joe Velky and outfielders Dave Rozzo and Erik Young, who returned from a big-hitting lineup that set school records in all offensive categories. He also interviewed head coach Bob Fisher and catcher Marty Kelly about their high expectations for the upcoming season. This television news story by WKYC Channel 3 sports reporter Steve Taylor aired on March 19, 1987, a day before the Yellow Jackets left for their spring break trip to Alabama. The Jackets were ranked ninth in the preseason, coming off back-to-back Ohio Athletic Conference regular season championships and a second straight appearance in the NCAA regional playoffs. After taking some batting practice off of pitcher Tom Jurcak, Taylor got footage of the team working out at Finnie Stadium and interviewed head coach Bob Fisher and third baseman Joe Velky about the upcoming season. 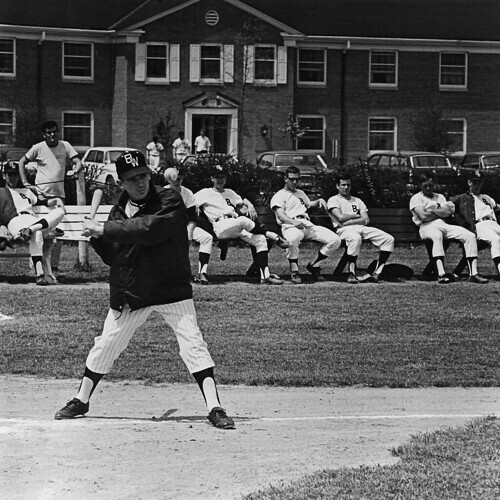 New head coach Brian Harrison got his first B-W baseball victory yesterday when the Yellow Jackets beat Ohio Athletic Conference rival Wilmington College 14–6 at the Snowbird Baseball Classic in Port Charlotte, Fla.
Head coach Bob Fisher hits fungoes during pregame warm-up at the B-W baseball field in the spring of 1970, just a few years after he was hired for the job by legendary B-W football coach and athletic director Lee Tressel. Watching from the row of benches that served as our “dugout” back then are, from left to right, pitcher Mike Blake, third baseman Melvin Grills, pitchers Ron Reifschneider and Lynn Thompson, infielder Ken Richardson, catcher Pete Sedello and pitcher Curt Karpinski.